We study the asymptotic tail behavior of the first-passage time over a moving boundary for a random walk conditioned to return to zero, where the increments of the random walk have finite variance. Typically, the asymptotic tail behavior may be described through a regularly varying function with exponent -1/2, where the impact of the boundary is captured by the slowly varying function. Yet, the moving boundary may have a stronger effect when the tail is considered at a time close to the return point of the random walk bridge, leading to a possible phase transition depending on the order of the distance between zero and the moving boundary. Sloothaak, F, Wachtel, V, & Zwart, A.P. (2018). 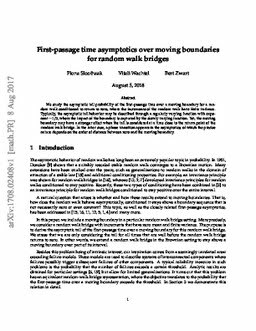 First-passage time asymptotics over moving boundaries for random walk bridges.